YAY for Witchlanders! 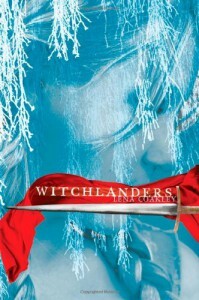 I LOVED Witchlanders! WOOHOO! I could tell you that it's been a LOOOONG time since I last had male main characters capture my heart like Ryder and Falpian did. I could tell you there's an AWESOME dog in it called Bodread the Slayer, who is more like a lapdog with very sharp teeth. I could tell you the intrigue and magic system are beyond brilliant. But I could also tell you to just go and read the book. Because, seriously, it was THAT amazing. I absolutely loved it, I cared deeply for all the characters and they've created a little place for themselves in my heart. Especially Bodread, I think he'd guard it quite nicely as well. I want to be friends with these characters, hug them when they're sad, sing with them. The only problem I have with this book is that the author told me she's not sure there'll be a sequel. I NEED a sequel! I'm not done having adventures with Falpian and Ryder and would love to see the Bitterlands for myself. This SHOULD be a series. This book here is why I love fantasy. Go read it.